Update: 20:30 Petition now has over 115,000 signatures. And here is a special video. Update: 14th May 2018 A Petition has been created here. It currently has over 97,000 signatures. If you have not already done so, sign it now! There is a reason I don't write articles for SpoilerTV, which is simply I can not write anywhere near to the standard our reviewers do. I post the fun articles, do graphics and make videos. So for me to "attempt" this should say a lot about this article as a whole. (So forgive my lack of writing skills). I have been here since the very first day of SpoilerTV and have seen many shows cancelled that I have enjoyed, this however is the first time I believe a show has deserved a bit more noise for a pickup. This may go without saying but numbers talk! There is still one more episode left and yes good ratings on one episode may not save it. But it will show that there are viewers out there, people who love the show, and want to see it return. Show FOX and other networks they have a potential audience out there. Tweet out as the show is airing, if you are in another country, just retweet those that are. If you can't watch the show for whatever reason people use DVR. This does have an impact on networks decision to keep/renew shows. No doubt you will be watching live but get a friend who may not watch Lucifer to DVR it as a favour. There is nothing stopping them getting caught up on Season 1 after they have helped to save it, show them your favourite episodes. Money matters! Networks are businesses, they need investment and advertisers is how that is done. During the finale send tweets and use the companies #'s who we see during the finale. Tell them thanks for supporting Lucifer and make sure you include FOX in your tweet to show them and the advertisers are being noticed. Again even if you are not watching live, support and retweet the accounts that are! The networks have already decided on their shows and schedule and it is going to take something major for them to change their minds. Streaming services however don't operate on a schedule. Make sure you tweet the main 3 @netflix @hulu and @amazon telling them if they take on Lucifer they will have a future customer. Money talks people! This one is key. Continue doing what you do. Share, tweet, support all of the fans out there. Every retweet spreads the message. Share this article, share other similar articles. Start a conversation with a fellow Lucifer fan, share your favourite episode scenes. Keep talking Lucifer. Saving a show is tough, and the odds are against everyone involved. But we have had 3 great years and many people involved in bringing us that. Take a minute and send thanks and support to some of those people (I've listed some of the main ones below). Every tweet they get I'm sure they value and appreciate, even if they can't reply to them all. There we go. I'm done. A lot of it is common sense to people, but if this helps a few people get involved, maybe it was worth it. Feel free to tweet me, tell me some of your favourite Lucifer stories. 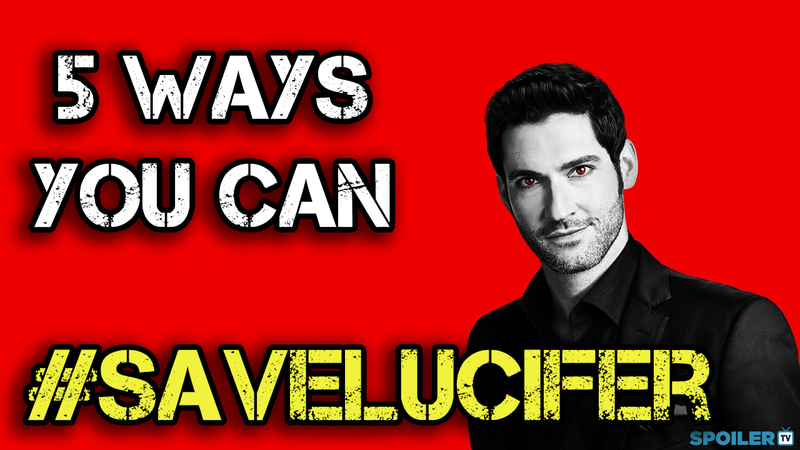 Let's keep that #SaveLucifer trending as long as possible!